When you are searching for bulk quantities of bedding linens for your needs in the hospitality industry, you can get excellent wholesale pricing on quality, inexpensive flat sheets that even ship free within the contiguous United States. These sheets are ideal for Resort Hotels, Motels, Healthcare Facilities, Nursing Homes, Resort and Day Spas and Fitness Centers with massage tables, Institutions, Colleges, Camps and many other businesses and private sector industries. These come in a case of two dozen. They are bright white cotton with durability and softness. They are CRF "Crease Resistant Finished" to eliminate wrinkling. Conveniently featured on all the different sized sheets are color coded labels to make it easy for the employees to identify sizes when they do the laundering. Brushed microfiber sheets are less expensive than cotton/polyester sheets but are also long lasting as well as soft and comfortable. Microfiber sheets dry 30 percent faster than cotton blend, which saves your employees’ energy and time. It is recommended to use a dryer sheet to prevent static cling and to minimize any wrinkling so that the sheets themselves will come out of the dryer nearly wrinkle-free. The numbers T-180, T-200, etc. refers to the thread count per square inch of the fabric. For example, T-180 has 180 threads and T-200 has 200 threads per square inch. The higher the thread count, the higher the quality of the sheet. Any questions you may have, or need for more information, and your order, either large or small, is handled with personal and prompt care and attention by your wholesale bedding linen provider to guide you in choosing exactly what you need to fulfill your specific requirements. Studies have shown that people usually sleep best at a room temperature that is between 62 and 70 degrees Fahrenheit. If the temperature in the room is too cold, then it can be very difficult for you to get a good night's rest. The right blanket can help you keep you warm, which can help improve your sleep quality and quantity. If you are looking for a great blanket for your bed, then you should definitely consider trying the wholesale dura-fleece blankets. Dura-fleece blankets offer many benefits, which is why they are a popular bedding option. These blankets are made out of durable, hotel-quality fleece fabric. They are designed to withstand commercial laundry. Additionally, these blankets have a durable, double stitch hem on both sides to ensure that they last long. The wholesale dura-fleece blankets are available in baby blue, tan, ivory, navy blue and silver. They are designed to provide you with long-lasting comfort. Getting a good night's rest will be a lot easier with one of these blankets. Furthermore, you will be getting a blanket that is resilient and will be able to provide you with comfort for many years. The money that you invest in your dura-fleece blanket will definitely be well worth it. Not only will this blanket help you sleep comfortably, but it will also help accentuate your room. These blankets are available in multiple sizes. You have the option of choosing a twin size blanket, which has a 66*90 dimension. You can also choose a full-size blanket, which has a dimension of 80*90. The queen size blanket is another option that you can choose, and it has a dimension of 90*90. Additionally, these blankets are available in king size. The king size has a dimension of 108*90. It is essential to protect a hotel’s expensive down or fiberfill comforters from moisture and grime with wholesale duvet covers made of high-quality fabric. It isn’t easy to fit a thick comforter into a washing machine and dryer, but a duvet cover is removable and simple to keep clean. If the comforter is filled with down, then constant dry cleaning is too expensive. A duvet cover is similar to a removable pillowcase that holds a pillow but typically fastens securely with lightweight color-matching hidden zippers along one or more edges. Crisp white bedding is always perfect for any bedroom because it matches everything, and laundry workers can wash the items in hot water that contains bleach. 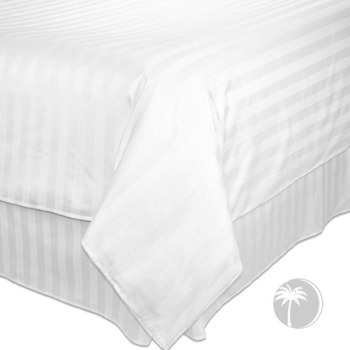 A white stripe duvet cover made of cotton and polyester blend fabric feels cool and comfortable against the skin. With a tone-on-tone subtle striping effect, it is easy to find complementary sheets, blankets, and a dust ruffle to permit decorators to create a beautiful ambiance in a hotel guest’s room. Available in cases of six in twin, queen and king sizes, a hotel manager can order these gorgeous linens quickly to have extras when the items are needed. With a 250 thread count, these wholesale duvet covers are durable and beautiful at the same time. A simple white duvet cover is suitable for protecting down or down-alternative comforters in homes, medical facilities or hotels. With concerns about cleanliness in hotel rooms, it is vital to have bedding that is washable and long-lasting. A duvet cover makes it easier for hotel staff to make beds quickly between guests who need to have comforters to stay warm in the coldest weather conditions. Bedbugs have made a big comeback. They were never eliminated, but the problem has grown in recent years. These pests feed on human blood, and this is why they prefer residing in mattresses, although they can live for a long time in many other areas of the home. Bed Bug covers are a solution to preventing bedbug bites and preventing the bugs from entering or leaving the mattress. Bedbugs usually come into a property by hitching a ride on used furniture, used mattresses, luggage, or clothing. No building is immune to bedbugs. This means that public places such as movie theaters and hotels may have bedbugs, which can be transferred to residences by getting into luggage or attaching to clothing. The bugs hide during the day and often go unnoticed until they begin causing problems. One of the first clues to a bedbug infestation is itchy bites. These bites are red and long lasting, and they can be anywhere on the body, but they tend to occur in groups of bites rather than a single bite. Another sign of bedbugs is spots of dried blood, which may be visible on sheets, pillowcases, bedding or mattresses. These pests also produce a musty odor, but this often goes unnoticed. Sighting the bugs is rare, but upon inspecting seams of mattresses or shaking out bedding onto a white sheet, the small, flat bugs may appear. The bedbug problem does not show signs of cessation in the near future. To avoid bedbugs in hospitality properties, it is wise to take proactive measures to prevent infestations, rather than wait until bedbugs arrive. Bedbug elimination is a time-consuming process due to their ability to proliferate very quickly and their ability to lie hidden in areas that are difficult to reach with pesticides. Calling on professionals for bedbug extermination is usually the best option. Bed Bug covers and pillow protectors are also an important part of the prevention or elimination of bedbugs. They also, very importantly, help prevent sleepers from being bitten by the pests while staying at your property. If you're looking to buy shower curtains wholesale shoppers can appreciate, then online distributors can make an invaluable resource for you. When you search for shower curtains on the Internet, you open yourself up to a wealth of diverse and high-quality choices that you might not be able to find easily in physical stores. Employees for many types of businesses are often responsible for acquiring new shower curtains in bulk. Hotels, fitness centers, beauty spas and medical facilities all frequently have to stock up on new shower curtains. People who choose to shop for shower curtains online can explore their choices in many styles of shower curtains. Shower curtains for medical facilities such as hospitals may need to be more muted and simple in design and overall appearance. 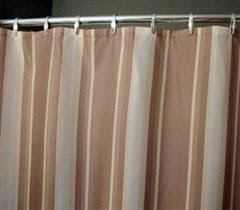 Plain white waffle weave shower curtains are often seen in hospitals, to be specific. Hotels, on the other hand, often display markedly more detailed and memorable shower curtains. People who stay at hotels often see shower curtains with noticeable floral and stripe designs. Hotel shower curtains also are often rather colorful. While overall design and appearance are indeed important factors for people to think about before buying shower curtains in bulk, people also need to think about product specifications. Size is a crucial factor for anyone who needs to buy bulk shower curtains. If a person is in charge of buying wholesale shower curtains for hotel rooms, he should make sure he has accurate sizing information for all of the guest units' showers. The material is yet another highly important factor. Since shower curtains are commonly available in materials such as fabric, vinyl, EVA (ethylene vinyl acetate) and PEVA (polyethylene vinyl acetate), people have to know which options suit their needs the best before buying anything. Shower curtains that are made of PEVA, for example, are considered to be environmentally friendly choices because they're devoid of PVC (polyvinyl chloride) and they're not chlorinated. People who are worried about potentially harmful shower curtains often turn to PEVA products to accommodate their needs. Shower curtains of all different varieties are made in many exciting styles and designs. Buying dishes, pans and pots that are designed for cooking meals can be an easy task for people who know where to look. The Internet is home to an abundance of dependable stores that sell wholesale cookware. Since buying cookware in bulk can be a major commitment, it's crucial for people to approach these purchases carefully and with ample patience. Wholesale cookware is often necessary for sit-down restaurants, fast food establishments, hotels, bed and breakfasts, educational institutions, nursing homes, and hospitals. Many online distributors sell cookware in bulk. 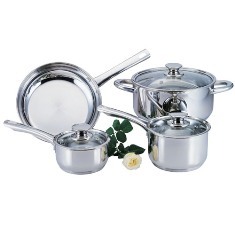 Cookware products are often part of convenient sets. Both non-stick aluminum and stainless steel options are commonly available. If an individual is looking to buy cookware for use in the workplace, then he should select the material that's the safest option for the specific environment. Non-stick aluminum and stainless steel both tend to be highly durable and dependable types of materials, however. Cookware sets that can be bought in bulk often consist of individual components such as quart sauce pans (two and three quarts), frying pans, cookie sheets, and Dutch ovens, among others. When people are preparing to buy cookware sets in bulk, they should diligently review the contents of all of their diverse choices. If appearance is a concern, cookware products are often manufactured using stainless steel that has an attractive mirrored finish, for one. Since many work settings are often extremely fast-paced and busy, people who need to buy cookware in bulk should also think about ease of cleaning. Some non-stick cookie sheets are designed to be extremely simple to clean. Convenient encapsulated bottoms are yet another major feature associated with cookware products. These kinds of bottoms are effective for helping with both strength and heat distribution that's even and consistent. If heat distribution is a big factor for an individual, he should make sure to avoid purchasing cookware that doesn't come with encapsulated bottoms. As far as cookware goes, subtle differences can often go an extremely long way. If a person is looking to buy cookware in bulk for a work environment, he should always make sure that productivity is part of his decision-making process. People who are shopping for wholesale pot holders can explore many options by browsing Internet retailers. Many professionals purchase pot holders in bulk for kitchens in dining establishments, hotels, bed and breakfasts, resorts, hospitals, nursing homes and schools. Individuals who are looking to buy pot holders in bulk should review the materials of the products that interest them. Pot holders are often made entirely of cotton, for example, which is beneficial for durability. Pot holders are also frequently manufactured in a wide range of different colors. Since pot holders can quickly get dirty and take on a dull appearance regardless of how often they're washed, careful consideration of color selection is always important. Taupe is a type of grayish-brown that often works well in pot holders. Deep chocolate brown is yet another popular color option for purchasers of pot holders. Designs for pot holders are typically simple and rather "no frills" in appearance. They often have basic square shapes, hemmed edges, and simple diagonal stitching. Hanging loops are generally attached to pot holders via sewing. People who wish to hang their pot holders when they store them benefit from this subtle feature. Washing considerations are also vital for those who wish to buy pot holders in bulk. These items are often machine washable, with cold water being optimal. Tumble drying without any heat is also typically beneficial for pot holders. Professionals who work for businesses should think about their laundry facilities and equipment prior to making decisions about these kinds of purchases. Size is yet another major component, especially as far as storage is concerned. Pot holders are often roughly 8 inches by 8 inches in size. When people shop for pot holders in bulk, they can often choose between different case packs and sizes. Wholesale case packs for pot holders often include 96 of the item in total. If an individual is looking to purchase pot holders for a large hotel update, then he may want to buy several case packs all at once. If he's looking to purchase pot holders for a smaller bed and breakfast or youth hostel, on the other hand, a single pack may be suitable.